“One of the most important contributions to the development of a scientific treatment of man’s social and political consciousness. The author begins by objectively classifying the various ideologies. This is followed by a step-by-step analysis of each ideological grouping – copiously evidenced by many actual examples of ideological thinking. The analysis, reveals inter alia, certain dynamic relations – hitherto unsuspected – between ideologies, and gives some hint of the unconscious mechanisms which underlie ideological and group behaviour. Part I ends by showing that a certain very important assumption – widely held by scientists and thinkers – concerning the mental evolution of man, is not supported by the facts. Part II starts with a definition of the scope and nature of ideology and makes a thorough analysis of the mental processes and structure underlying ideological phenomena. 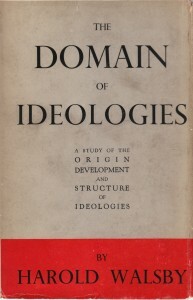 The book concludes with a detailed account, in terms of these basic mental processes, of the ideological growth of the individual from birth to maturity.” – Dust jacket to the 1947 edition of The Domain of Ideologies. 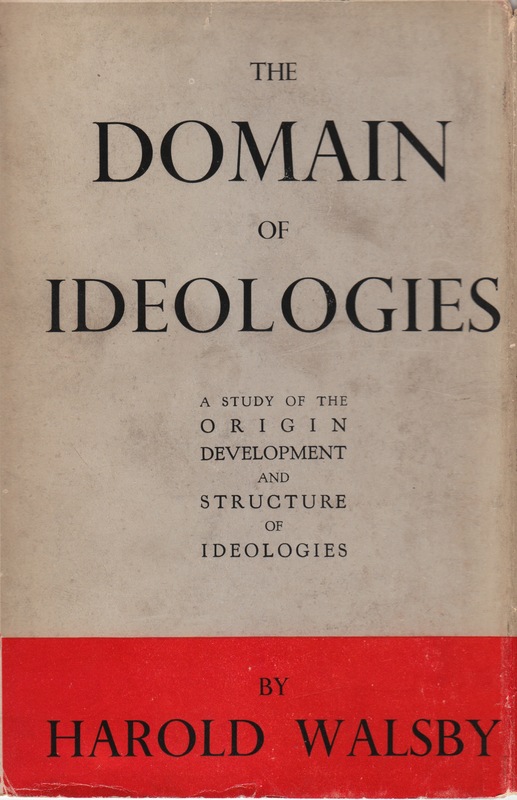 This new electronic edition of The Domain of Ideologies is the first since its original printing in 1947. The current edition has made every effort to preserve not only the content but also the ‘tone’ of the original. However, in addition to minor changes in format, there have been some compromises negotiated between the English of mid-20th Century England and the English of the United States in the early 21st Century. A bibliography, an index and critical reviews of the book have been added. See An Outline Sketch of Systematic Ideology by George Walford (1977) for a 32-page overview. Social Science Bulletin Special Issue 1 January 1948 (“We have just received […] a small delivery of Walsby’s Domain of Ideologies…”). Tribune, 30 January 1948 (“Special Review of Walsby’s Domain of Ideologies“). Tribune, 6 February 1948 (“Harold Walsby’s Domain of Ideologies“). A Domain Still Unexplained by George Woodcock from Freedom, 21 February 1948.
Review by Richard Tatham from Science & Ideology 1, March 1948. Science and Anarchism by Richard Tatham from Science & Ideology 2, April 1948. A Sociologist at Large by Lan Freed from Rationalist Press Association Literary Guide, May 1948. The Importance of Evidence by Richard Tatham from Science & Ideology 4, June 1948. The American Political Science Review, Vol. 42, No. 3, June 1948, page 631 (“Recent publications of political interest”). Review by H. H. Preece from The Free Thinker, 15 August 1948. The Basis for Action from Science & Ideology 7, September 1948. New Statesman, Volume 8, Issue 355, 1948. British Book Bews by the British Council, 1948. The Sociological Review, Volume 40, 1948. The Dublin Magazine, Volumes 23-24 by Seumas O’Sullivan, 1948. The Oxford Magazine Volume 67, 1948. Wales Volume 8 Issues 29-30 by Druid Press, 1948. Foreign Affairs, Volume 27 by the Council on Foreign Relations, 1949.
Review from Universum 3, 20 March 1949. Infantry Journal, Volumes 64-65, 1949. The Domain of Sterilities by Gilmac from The Socialist Standard, April 1949. Mugwump and Moonshine by Harold Walsby, circa 1949. Report of the 20th Meeting of the 46th Editorial Committee. 17 May 1949. (“Editorial Committee asked the EC to endorse their action in not publishing a 4,000 word reply received from the SSA of the criticism published in the [Socialist Standard] of the book Domain of Ideologies and to publish a short statement in the [Socialist Standard] dealing with this matter. Resolution: Cash and Waters ‘That the recommendation of the Editorial Committee be accepted.’ Agd.”). Heaven and Communism by P. J. Rollings from The Socialist Leader, 25 March 1950. Fundamentals of World Organization by Werner Levi, 1950. Public Opinion Quarterly, Vol. 19, No. 1, Spring 1955. The Reading Standard, May 4 1956. Social Control by Joseph Slabey Rouček, 1956. Democracy, Ideology, and Objectivity by Arne Næss, 1956. On Not Being Able to Paint by Marion Blackett Milner, 1958. Midwest Journal of Political Science, Volumes 4-5, 1960. Midwest Journal of Political Science, Vol. 5, No. 4, Novenber 1961. Ideologie by Jürgen Frese, 1965. Individualism and Nationalism in American Ideology by Yehoshua Arieli, 1966. Guide to Reference Materials in Political Science Volume 1 by Lubomyr Roman Wynar, 1968. Idee und Ideologie by Erwin Hölzle, 1969. The Failure of Elites by Frank Bonilla, 1970. Ideological Tendencies Within Chilean Christian Democracy by Michael Fleet, 1972. Marxism, Communism, and Western Society edited by Claus Dieter Kernig, 1973. The Science of You by John Rowan, 1973. The Social Individual by John Rowan, 1973. Psychological Aspects of Society by John Rowan, 1973. Systematics Volume 11 by Coombe Spring Press, 1973. Mr. Jinnah as a Political Thinker by Shafique Ali Khan, 1974. The Sociology of Karl Mannheim by Gunter W. Remmling, 1975. The Monument by Robert Barltrop, 1975. Draft Introduction for an intended second edition by Peter Shepherd circa 1976. Myth, Symbolic Modes and Ideology by Albert B. Friedman, 1976. Ideologie – Wissenschaft – Gesellschaft by Hans-Joachim Lieber, 1976. Critique épistémologique de l’analyse systémique de David Easton by Denis Monière,1976. An Outline Sketch of Systematic Ideology by George Walford, 1977. Peter Hunot: Ideology Before Walsby, Some Notes on Karl Mannheim’s Work on Ideology by Peter Shepherd, March 1979. Nationalism in the Twentieth Century by Anthony D. Smith, 1979.
International Political Science Review Volume 1 by the International Political Science Association, 1980. Human Inquiry by Peter Reason and John Rowan, 1981. Revolutions and Revolutionists by Robert Blackey, 1982. Budaya Politik dan Pembangunan Ekonomi by Albert Widjaja, 1982. The British Political Tradition by W. H. Greenleaf, 1983. Old and New Questions in Physics, Cosmology, Philosophy, and Theoretical Biology edited by Alwyn van der Merwe, 1983. Science and Public Policy, Volumes 11-12 by The Science Policy Foundation, 1984. Gleichheit oder Freiheit? by Erik von Kuehnelt-Leddihn, 1985. Annals of Theoretical Psychology, Volume 5 edited by Leendert P. Mos,1986. The Suppressed Madness of Sane Men by Marion Milner, 1987. Second Chance in Education edited by Dan Inbar, 1990. Contemporary Political Ideologies: a Comparative Analysis by Lyman Tower Sargent, 1993. An Introduction to Problems in the Philosophy of Social Sciences by Keith Webb, 1995. Ideologie und Utopie by Karl Mannheim, 1995. Political Research Quarterly, Vol. 50, No. 4, December 1997. Ideologies and Political Theory: A Conceptual Approach by Michael Freeden, 1998. From Politics Past to Politics Future by Alan James Mayne, 1999. Subpersonalities: the People Inside Us by John Rowan, 1990. The Socialist Party of Great Britain by David A. Perrin, 2000. Embodied Theories edited by Ernesto Spinelli and Sue Marshall, 2001. The Selected Works of Arne Naess, Volume 1 by Arne Naess and Alan Drengson, 2005. On Becoming a Psychotherapist by Windy Dryden and Laurence Spurling, 2006. Ecology of Wisdom by Arne Naess, 2008. Mirrors Tryptych Technology by Diana Silberman-Keller, 2009. The Hands of the Living God: An Account of a Psycho-analytic Treatment by Marion Milner, 2010. Community Practice: Theories and Skills for Social Workers by David A. Hardcastle, 2011. Police Reform in China by Kam C. Wong, 2012. Metaphor and Dialectic in Managing Diversity by Christina Schwabenland, 2012.